In our last article, we have explained how to use df (disk filesystem) utility to report file system disk space usage in Linux. We have discovered yet a another great utility for the same purpose but with a prettier output, called discus. 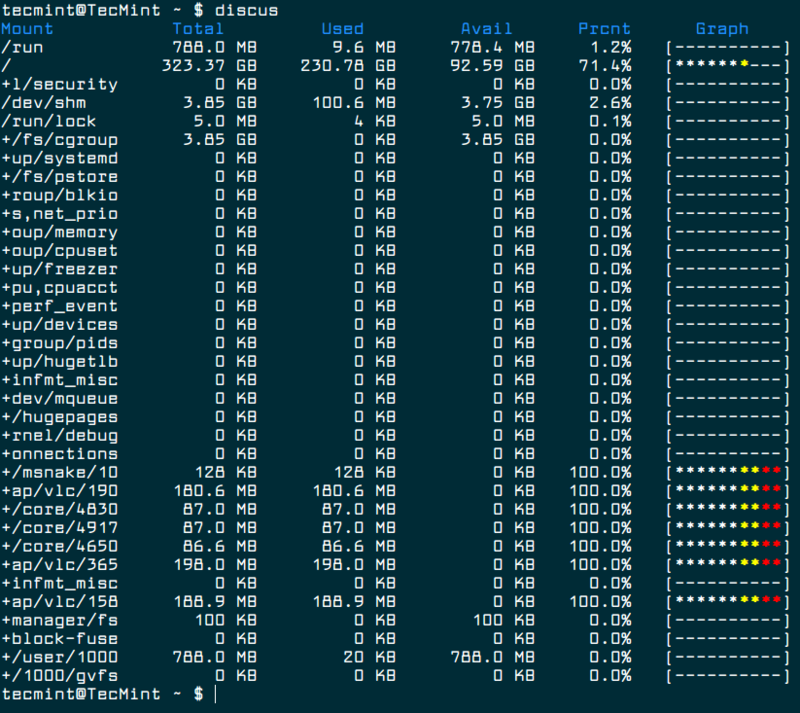 Discus is a df-like, highly configurable utility for checking disk space utilization in Linux, intended to make df prettier with fancy features such as colored output, bar graphs, and smart formatting of numbers. To configure it, you may copy its main configuration file /etc/discusrc to ~/.discusrc and do your customization in there. The package discus is available to install from the default system repositories using package manager on Linux distribution as shown. After installing discus, learn how to use discus with the following examples. Run the discus command with the default settings. To disable the color, use the -c flag. To display device names instead of graphs, use the -d flag:. If do not want to use smart formatting, you can disable it using the -s switch as shown. You can specify the number of digits to right of decimal place using the -p flag. To display sizes in kilobytes, gigabytes, megabytes, or terabytes use the -k, -g, -m, or -t flags respectively. For example. Last but not least, if you want to configure it to your preference, copy its main configuration file /etc/discusrc to ~/.discusrc as shown. Then open the newly created file and perform your customization. For more information, see the discus man page. 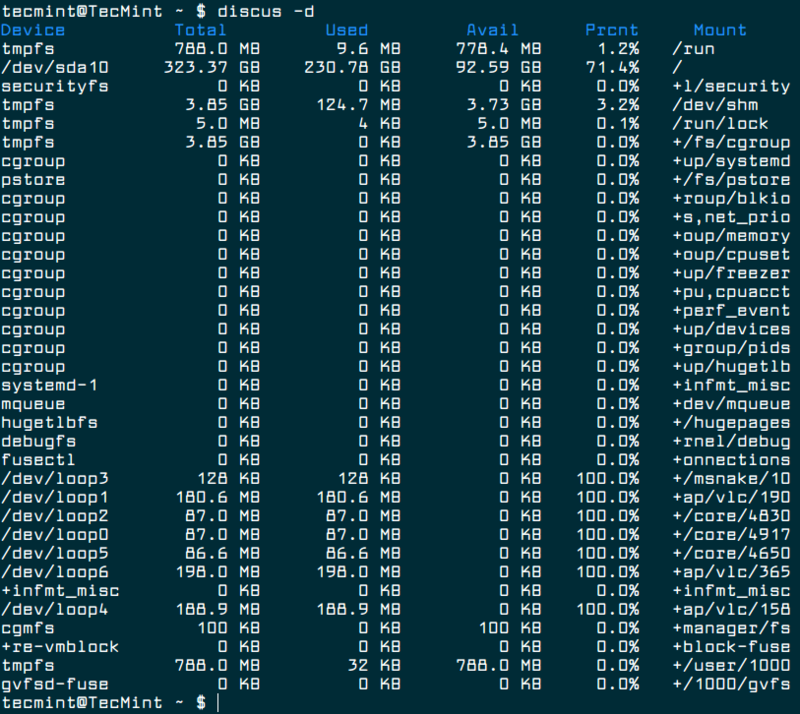 You may also like to read these following useful articles on Linux disk space usage. That’s all! Discus is a simple utility intended to make df command prettier. Try it out and let us know of thoughts in the comments section below. Last metadata expiration check: 0:00:20 ago on Di 02 Okt 2018 10:54:21 CEST. Wow, I had no idea anyone still used this. I wrote Discus in 2000. I haven’t thought about it in years, yet here is a brand-new review of it. Welcome. Maybe you should consider getting back to it. This package is not available in CentOS 7 or EPEL repositories. Tecmint, why do you hurt me so? This is the second thing I have tried from this site this month that does not work on CentOS. Recommend testing before writing. Aaron, I tried installing Discus on a Centos 7.5 but it wont work, previously you suggested to enable EPEL but this still not working. Do you know what other Repository I can use to download Discus? This really fills out a very much-needed gap in the Linux world. 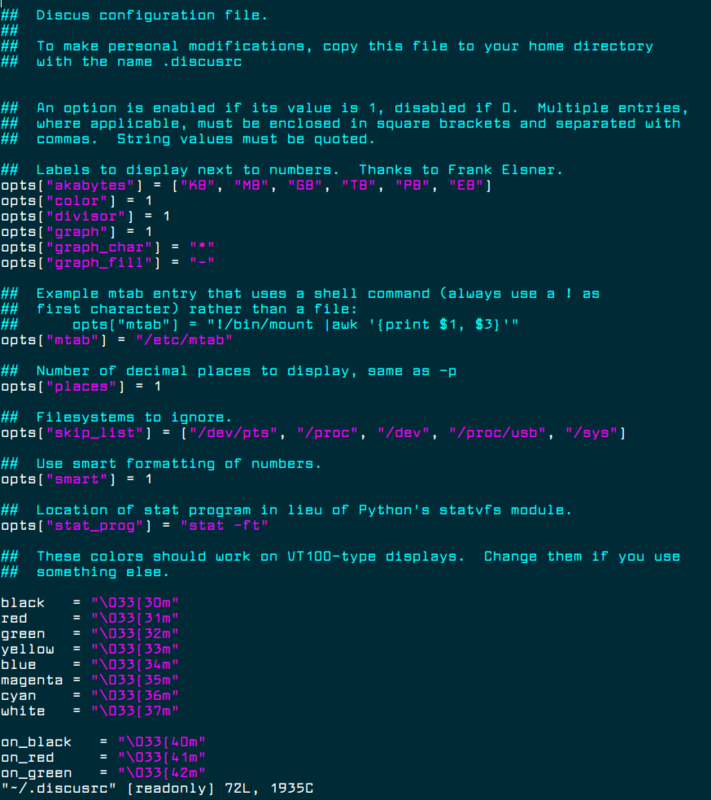 Nice terminal font! What’s the name? Thanks!